Coastal properties can take the brunt of the weather. Coastal properties, especially those not sheltered by other properties or hills, are effected by the elements much more than inland houses. Ocean spray, storms coming in off the water, increased ultraviolet damage from the sun, to name just a few, all take their toll on a building’s substrate and paintwork. You’ll need to carry out some detailed inspection, possibly some repairs, and certainly some preparation. The location and orientation of the building will have a large impact on how much damage it may have suffered – visible damage and hidden. The main issues faced by buildings in seaside locations are erosion, damp and rust. Wind-driven rain, especially with a high salt content, erodes the weather protection of the building. 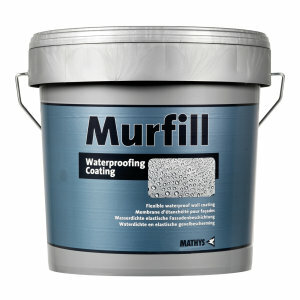 This could cause cracks and loose render, and damp penetration to walls, timber and even flooring. Exposed metalwork may rust and, in buildings with rebar, if there’s enough damage to the concrete it’s possible for water to penetrate and rust the rebar. Cracks in render that allow water ingress can also result in toxic mould growth internally. 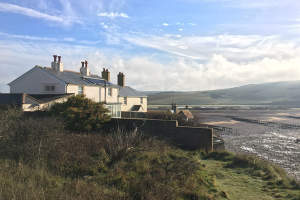 Specialist products can help coastal properties battle the elements. Major damage should, of course, always be addressed by a suitably qualified professional; a structural engineer will advise on anything that goes beyond loose render. Fortunately, all of the necessary decorating supplies can be sourced from Brewers. Paints aren’t our only speciality! For render repair, products such as Touprelith F and Prestonett Waterproof Masonry Filler may be suitable. We can supply data sheets or advice in-store, so feel free to test our knowledge. What’s essential is that cracks and holes are dealt with quickly, as allowing water ingress will increase the amount of damage and therefore repair work needed. Before you begin repairs, it’s wise to remove all salt and dampness from the surface wherever possible. Repairs to exterior woodwork, from sash windows, cills and shutters to balusters, cornice mouldings and verandas, also mean choosing the best product. Skimping will cost you in the long term. Any loose debris should be removed and any rotten timber replaced with a suitable filler or, if not too far gone, treated with suitable preservers or sealants. It’s probably worth making sure any trace of algae or mould is also removed, a surface cleaner such as Dulux Trade Weathershield Multi-Surface Fungicidal Wash will do the trick. Brewers’ range of decorating sundries for woodcare and wood filling also includes products from Sadolin, Cuprinol, Ronseal, Liberon, RepairCare, Blacfriars, Johnstone’s, Solignum and more. Ask your local Brewers branch team for advice on the best product for the specific job in hand. Add a splash of colour to the seaside. For balconies, railings and other metalwork, assuming that it remains sound, repair and maintenance should be straightforward. Remove all loose paintwork, ideally stripping off the paint entirely (we stock a number of paint strippers suited to different sorts of paint), dig out any badly rusted metal, de-grease and then fill and repair if necessary. Bradite and Rust-Oleum are reliable brands you’ll find in-store, for treatment, preservation and painting of metal. Preparation is key, however severe the damage and whatever the surface. All loose material – from flaking paint to blown render – needs to be removed. Failure to prepare the surface means that you’ll find there’s not enough adhesion, you get uneven results or that the new surface will fail sooner. Not every surface is suited to waterproofing; some building materials, and indeed parts of the building, are designed to be porous and breathable. We advise consulting our in-store teams or an independent expert before waterproofing external brickwork and masonry. Once your preparation work is complete, you can move on to the final stages. Again, for a finish that will last as long as possible, you want to be thorough and choose the best products for the job. Always choose a good quality primer, unless you’re choosing a product that can be safely applied directly to the base substrate. Rust-Oleum’s Noxyde, for instance, can be applied to new or bare steel; it’s an elastic coating with excellent anti-corrosive and water-resistant properties, and won’t flake because it flexes with the expansion and contraction of underlying metalwork. 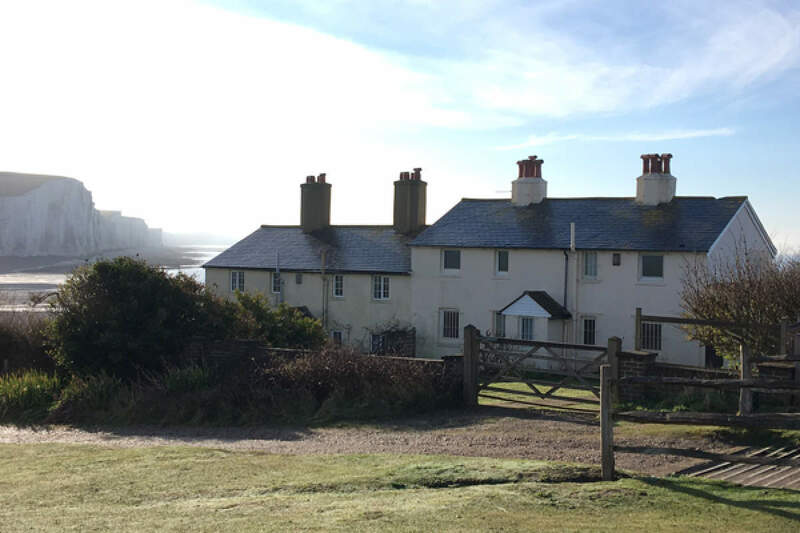 Other products we know to be particularly well-regarded in demanding coastal areas include Murfill Waterproofing (our Protective Coatings team has even used this to protect a lighthouse) and Johnstone’s Stormshield Pliolite Based Masonry Finish. You’ll find a large choice of exterior wood paints, metal paints and masonry and render paints in your nearest Brewers Decorator Centre – and if what you need isn’t in stock, we’ll order it in especially. 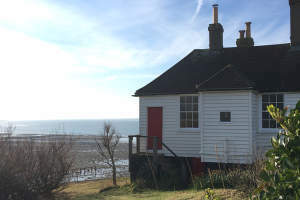 While some standard trade paints will be up to the task when painting property exteriors in a seaside location, it’s worth the extra investment in sourcing specialist paints and surface coatings. These will have been formulated to do a very specific job and withstand tougher climates for longer.